T1 and T2 are not assayed, but with this being a natural product will be within the ranges expected in each type of gland. 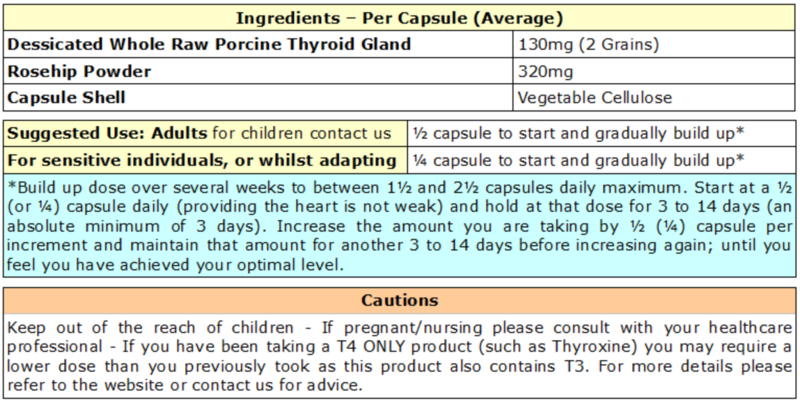 Thyro-Active PORCINE VARIANT is made from the thyroid gland of the pig. If you have no problem with eating pork, we recommend trying this one first, because porcine products are closer to human biology. 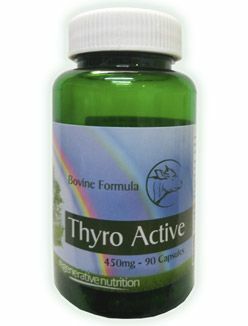 Thyro-Active BOVINE VARIANT is made from the thyroid gland of the cow. If you have allergies to pork, or do not eat pork for religious reasons, this is an excellent option. Many prefer the BOVINE VARIANT even with no issues about eating pork. It's best to try each at some point (if one has no issues with pork) as you will be able to determine the best option for you. Natural Thyroid comes from healthy livestock. Natural Thyroid is intended for the natural treatment of hypothyroidism (under-active thyroid). Unlike most remedies for the thyroid gland, which offer benefits for both under and over-active conditions (hyper & hypo); this remedy is intended solely for use in hypothyroidism (under-active thyroid). If suffering from hypothyroidism, especially if the gland has been under functioning for many years, the use of a desiccated bovine thyroid, such as this, can have tremendous benefit and work far more effectively in the majority of cases than the drug Synthoid /Thyroxine or other forms of drug synthesized T4 hormone. The pharmaceutical hormone is not exactly the same as that used by the body to maintain correct metabolic rate. The most important hormone to maintain sufficient metabolic energy is T3, although this is in lower quantities than T4 secreted from a healthy thyroid. Most T3 is obtained from T4 conversion. The most often prescribed artificial hormone for thyroid under functioning is T4 (Thyroxine, Synthoid etc.). Many people have a low capacity for this conversion of T4 hormone to T3; this is why many people do not obtain sufficient benefit from taking a T4 only hormone prescription. Taking desiccated thyroid gland can have wonderful effects on a the health of those suffering from hypothyroidism. Please see the further reading tab above for more in depth information. Why is my therapy not working? If the remedies of choice are not working for you, then there could be an underlying hormonal balance issue preventing your health improvement; a fundamental problem that needs resolution before you can progress further. This is the matter of Low Metabolic Energy. Please look at the summary chart below, is any of this familiar? if so, please view our excellent resource to determine the extent to which an individuals health issues may relate to adrenal problems, thyroid problems or a combination of both. Please click here to view the article. Low body temperature. Coldness. Low Energy or Fatigue. Weight problems (can't lose or gain it). Slow healing . Depression. Anxiety. Poor memory, focus, or concentration. Sleep disorders. Under-Reactiveor Over-Reactive: Frequent infections (skin, sinus, bladder, bowel, yeast problems, etc.). Allergies. Auto-immune disease. Fatigue. Fibromyalgia (muscle or joint pains). Generalized aches/pains. Repetitive use injury and carpal tunnel syndrome. Weak connective tissues (ligaments, bones, etc). Headaches. Loss of Libido and function. Menstrual disorders. Infertility. Low blood pressure. High blood pressure. Raynaud’s disease. Numbness of hands and/or feet (usually symmetrical). Dulling or loss of senses such as vision, taste or smell. Dry. Acne. Pallor in light skin, darkening or dark patches in dark skin. Hair loss, brittle, coarse, dry or oily. The first test will indicate the state of thyroid function and hence indicate a need (or not) for Natural Thyroid whilst the second test indicates adrenal sufficiency/deficiency. The reason for this second test is that if adrenal deficiency is indicated, then Natural Thyroid should be deemed unsuitable until such time as that deficiency has been resolved. Not doing so can cause quite serious health issues. Taking Natural Thyroid, especially during the several week adaptation period, will demand higher than normal levels of bodily hydrocortisone (cortisol) (the adrenal hormones, especially hydrocortisone, are the coping/adapting hormones), if the required cortisol is not available then one can 'crash'. Examples of this are serious fatigue, flare up of pre-existing auto-immune disease (including asthma) and even failure to deal with infections. A good bodily supply of hydrocortisone (via Adrenal MAX Support if bodily supply is deficient) is essential before using Natural Thyroid. It takes a few weeks of taking Natural Thyroid for the long acting T4 levels to build up; one reason for the generally recommended gradual raising of dose over a few weeks. Typically most people need to build up over several weeks to a level between 1½ and 2½ capsules daily. Begin by taking half to one capsule daily*. Generally it is found to be safe to start at a half capsule daily (providing the heart is not weak) and to hold at that dose for 3 to 14 days (an absolute minimum of 3 days). *Some very sensitive individuals may even find half a capsule daily overly stimulating in which case start at ¼ capsule daily. Increase the amount you are taking by half capsule and maintain that amount for another three to fourteen days before increasing again; until you feel you have achieved your optimal level. Each week, continue to test oral temperature and pulse for three days in a row per the Barnes Basal test outlined in the link above and take the average reading. If the temperature and pulse are still low, continue to increase dosage. If you feel you have exceeded a tolerable dose* stop thyroid for one day and resume at a slightly lower dose. *The symptoms of taking too much Natural Thyroid are a nervous or jittery feeling, similar to having drunk too much coffee. For some, these symptoms include palpitations (increased heart rate). Do not rush the process, and do not exceed five capsules daily. If you have reached five capsules a day and still feel you need more support then other metabolic energy issues need to be worked on. Please click here. Note: Children need less and respond faster. Also, until the age of about eight years, a child’s pulse is high, around 110 beats per minute, so the only reliable test in young children is the temperature. It is important to keep a detailed journal or record of Natural Thyroid use so gradual improvements can be noticed. This should consist of dosage and description of how you feel and indicating when the dose has been increased etc. How long will it take to see any results? Some people report immediate results while others report more gradual improvement. It is an important part of the process to allow the body time to adapt. In general, the lower the basal temperature, the more support one may need and the longer it may take to feel better. Each person needs to find the right level for their body. Keep in mind that it is possible for that amount to vary. Many report needing less support if they travel to warmer climates and more if they travel to colder climates. The symptoms of thyroid and adrenal imbalance can be similar. Click here for a more detailed article with graphs. Hypothyroidism can lead to low blood sugar, increased adrenalin and increased cortisol. Although many of those with hypothyroidism conversely experience low cortisol output due to adrenal insufficiency. It is interesting to note that cortisol is required for efficient use of thyroid hormones by all of the body’s cells. Excess adrenalin in the long term can cause a racing pulse, irregular, or fast heart beat, anxiety and panic attacks, hypertension and can eventually lead to heart disease. Adequate thyroid function is necessary to control adrenalin at normal levels. The higher your adrenalin, the slower you must increase your dosage to avoid symptoms of excess adrenalin. As Natural Thyroid is slowly increased, adrenalin slowly decreases to normal. 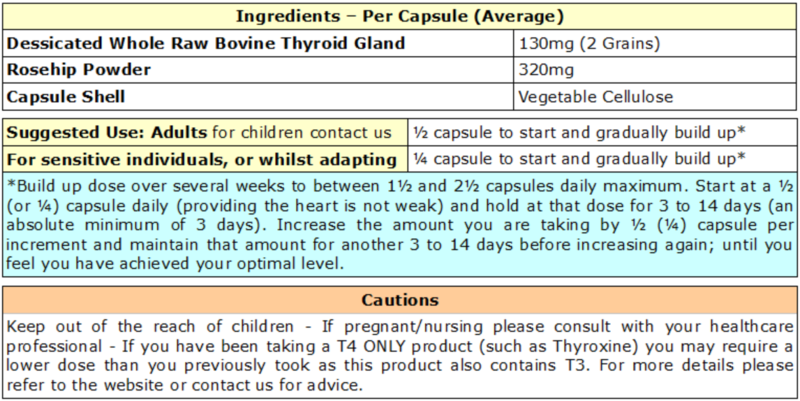 Some people can only tolerate ¼ capsule of Natural Thyroid at first and can only increase by ¼ capsule doses. Higher dosages are needed in those who eat excessive unsaturated fats such as bean, seed and nut oils, which inhibit thyroid function. Some of the symptoms of hypothyroidism can be: depression, low energy, fatigue, frequent infections, chronic headaches, circulatory problems, chronic skin problems, poor memory and/or concentration, eczema, psoriasis, asthma, excessive weight, irregular menstrual periods, neurosis, irritability and hair loss amongst others. If the outer 1/3 of your eyebrows do not grow then hypothyroidism is probable. If you suffer from weak adrenal glands or adrenal insufficiency it is unwise to take Natural Thyroid or any thyroid hormone without first supporting adrenal hormone output with a remedy such as Adrenal MAX Support (cortisol) and/or DHEA. As soon as you have established a dosage regime for adrenal hormone(s), if needed, you can start with Natural Thyroid. If cortisol /DHEA is low due to adrenal insufficiency; taking Natural Thyroid will increase the metabolic rate as it should do. This will, for a time (maybe months), increase the need for circulating cortisol/DHEA. Without the support of supplemental cortisol and/or DHEA the demand on the adrenal glands could cause further enervation resulting in dangerously low levels of cortisol/DHEA. If you are unsure if you have low adrenal hormone output, read the articles for these products (as linked above) for information on how to ascertain adrenal hormone output (especially cortisol). If you experience a racing pulse with low temperature, it’s often due to excess adrenaline, not hyperthyroid function. Most people who are hypothyroid have a daytime oral temperature of less than 98.6oF/37oC and a resting pulse lower than 75-85. A few patients have an abnormally high pulse due to excess adrenalin, the body’s way to compensate for sluggish thyroid function. Many hypothyroid people have from 10% to 40% excess adrenalin. Thyroid hormones will make the tissues more sensitive to adrenaline and some people will feel hyperactive at the beginning due to increasing tissue sensitivity to adrenalin. But, as the tissues become more sensitive to adrenaline, less will be produced and hyperactivity will disappear. It takes several weeks or months to calm the adrenal glands. Natural Thyroid has both a cumulative as well as a healing effect. So it is wise to keep track of your oral temperatures and your resting pulse. Don’t guess. Low and high thyroid symptoms can be identical (e.g. insomnia, restlessness, and headache). Patients with high blood pressure or colon problems may experience a headache due to increased circulation and small changes in blood pressure or colon pressure. If this occurs, stop the Natural Thyroid until the headache has gone, and then resume taking. As blood and colon pressure normalises, headaches will cease. If it’s a colon headache, work on correcting constipation first, then go back to working on optimizing your temperature and pulse.